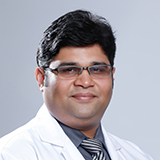 Dr Mohammed Shafi completed his M.B.B.S from Yenepoya Medical University (Mangalore, India) which is affiliated to (Rajiv Gandhi Institute of Health and Science) in the year 2005. He then went on to do his post-graduation in General Surgery from the same institute and completed in the year 2010. He joined as a senior resident and got promoted to assistant professor one year later. He has more than six-year work experience. During this period, he got himself trained for laparoscopic surgery from Coimbatore under Dr. Venkatash (Director of V.G Hospital, Coimbatore, Tamil Nadu). In 2015 he was promoted as a post Graduate guide and he has trained two post graduate student under him. He was also heading a unit in surgery department. He speaks English, Urdu, Hindi, Kannada fluently.